Welcome to our customer reviews page. Here you’ll find reviews from work we have completed over the last few years. We hope you find them helpful. If you have any questions about our services, please don’t hesitate to contact us. 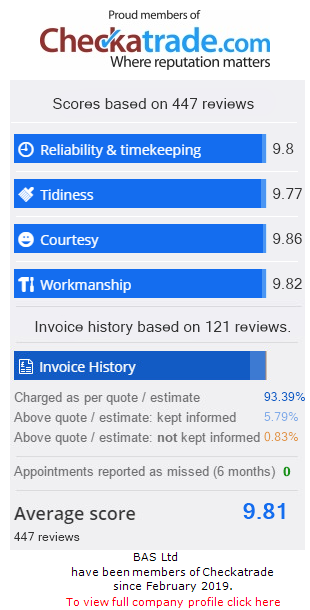 You can click here to leave your own review on our site or click here to reviews us on our preferred platform – Checkatrade.com. Further reviews can be found on our Google results page, Facebook Page and on Yell.com. Kept me informed of arrival time. Wall mounted the large TV with ease. Supplied extra long cables needed so I could position the TV where I wanted it. My aerial for Freeview had been disconnect he added something to the satellite dish and tuned in all the Freesat channels for me. Also gave me advice on how to set up my pay TV when it arrived. So happy with the service would recommend to anyone in the area. Shaun carried out the work to a really good standard. He was pleasant and really polite, he answered any questions we had as he carried out the work. Will definitely use their service again. Very professional efficient and knowledgeable, we left them to it after they asked how we wanted things set up … came back when the work was done … not once did we have to give input again after they first asked us about how we wanted things set up and now we have a fantastic place for the family to sit and watch movies, etc … highly recommended would never use anyone else again. Great service from making telephone inquiry to completing job. Very friendly and professional service, courteous and timely communication all the way. Price for the job was great too. I would highly recommend this company. Excellent communication with office (Martin), and engineer (Hedley) was very helpful with advice. Arrived on time, work took a bit longer than he expected, as he made sure the bracket fixings were absolutely secure (to the extent he removed his original ones and re-did with longer ones he was not 100% happy!) – very happy with his dedication to get the work 100% to his satisfaction – and mine! Will definitely be using them for future projects. Work completed to a good standard and as quoted. Prompt responses to queries. Would use again. Great service and really helpful engineer. Rang them in the morning and aerial was replaced by the afternoon. All tested and working perfectly. Thanks. Excellent. Quick response. Highly efficient. Fixed the problem. It was so easy to get my aerial fixed. I am very busy with work and everything was arranged by text. Was an easy call to make the booking and arrange for my tenants to schedule the visit. Work onsite was at time agreed and made diagnosis/suggested repair. My bad, I missed the engineer’s call, but once contact was made and repair agreed, he came back the same day. Paid over the phone via CC. Post repair query was dealt with promptly/satisfactorily. Highly recommended. Very responsive to our request for quick arrival time due to aerial hanging from a high wall with pedestrians and vehicle passing. Very polite and professional. Highly recommend these guys. Lady who answered the telephone was very helpful and accommodating and arranged for the repairman to ring me before his arrival (which he duly did). He was very prompt and efficient. Booked this on the Friday and was offered an appointment for the next day. Highly recommend these guys. Sean went beyond efficiency in replacing the aerial as he noticed and informed me about a slate had dropped into the gully of the roof where he was about to work and he immediately pushed it into place, Particularly grateful in light of torrential rain next day! After work completed he ensured that my TV channels/signal were working correctly/cleared up old aerial parts to stack neatly. Phoned in advance of arrival, punctual, very polite and obviously knows his trade and takes pride in the high standard he has. Highly recommend. Great service from a local supplier definitely a company to recommend. Berkshire Aerial Services obtain 100% rating from us. The service was on time, efficient, clean and correct. Many have tried before to solve our reception issues but only Berkshire Aerial Services achieved this. An added bonus was that the price was also extremely reasonable. Highly recommended. Arrived on time, quick installation, professional service, would use again. Very nice chap told me how much it would cost and fitted new aerial and indoor amp and made all the new connections within the hour. Very pleased! Genuinely cannot fault any part of the booking process nor the work that was done. Everything about this company gave me confidence that the price quoted was what I’d be charged, the bracket I’d pre-purchased was suitable and that the work would be completed to the standard I expected. TV looks fantastic on the wall and the installer even threw in a little piece of trunking to hide the wires for no extra charge. Very impressed and wouldn’t hesitate to recommend and use again. Absolutely fantastic service, made a call and installed the same day. The engineer was extremely helpful and quick. I would definitely recommend Berkshire Aerial Services. Having just had my aerial problem resolved, I can fully recommend Berkshire Aerials. Phoned on Monday morning and was dealt with promptly and courteously (always a good start). Sean the engineer arrived on time the following day and not only resolved the problem but also explained what the issue was as he went along. Thanks Martin and Sean. Great service – just a few days between website enquiry and installation. Technician called pre-arrival to check time was suitable and was a real gentleman. Cable hidden, neat installation and really considerate of carpets etc. In fact, I am intending to use them again to improve on our bad wifi – survey + fix. Would recommend to anyone who likes to deal with nice, honest people. You came to help me out approximately ten years ago. Your service at that time Martin left such a good impression, I kept your card. All these years later I’ve called you again, and still an excellent service from you…. a prompt response to my call, a pleasant professionalism throughout, clear advice, perfect and tidy workmanship etc etc… once again thank you so much Martin and Hedley. Just had Hedley round to wall mount my TV, excellent service – very knowledgable, on time and extremely tidy and efficient. I can’t recommend enough, Great job – one very pleased customer. Absolutely excellent service. Helpful, prompt and clean and tidy. I am really impressed with these guys – I highly recommend them. They gave great advice when I called (and I’m not knowledgeable about cabling etc so it was much appreciated) and Hedley made sure that after the installation my broadband was working properly and that my computer etc were all linked up. Thank you! Friendly and flexible with a fair and reasonable price for parts and labour. Highly recommended. Many thanks to Martin for accommodating our requirements at such short notice. Friendly and flexible with a fair and reasonable price for the parts and labour. Excellent service and Shaun the engineer was so helpful and very professional 5*. Sean did a really excellent job. Very friendly and polite. If I ever need any more of this type of work done Berkshire Aerials are the first people I will ring. Thanks guys. Just had our TV mounted to our chimney breast by Berkshire Aerial. They have done a fantastic job. All cables are hidden and nothing was too much bother. Clean, tidy, friendly. Would recommend to everyone. Thank you! Brilliant service, quick and friendly! Great service, super friendly would highly recommend. We had an extra point installed, a TV mounted on the wall and new amplifier, all kids now very happy all TVs up and running! Absolutely chuffed to bits with the service provided. I booked this morning and by the evening the TV is up on the wall. Hedley gave me good guidance on the TV being positioned and was very helpful. The area was left very clean and tidy. Work was very professional. Could not fault the service of the online support and the engineer that visited us. Would not hesitate to recommend Berkshire Aerial Services at all, definitely worth it. Thanks for the great service. Have used Berkshire Aerials for a number of years and have always found them to be personable and good. Excellent service, very friendly professionals. A very professional service. Very polite and reliable, I would highly recommend. Good and prompt service. Job done quickly and efficiently. Engineer very polite and cheerful. Would definitely use Berkshire Aerials again. Thank you. Very pleased with the service, lovely man I would definitely use them again if necessary. Fabulous service!!!…. I called Berkshire aerials late on Friday evening and an engineer was out this morning fitting a new aerial…. nothing was too much trouble for these guys… the engineer that came was also caring,understanding and very patient I will definitely be recommending Berkshire aerials in the future and if I need any work done in the future I will now not bother to google places I will go straight to Berkshire aerials…. thank you so much guys!!!!!!! Martin from Berkshire Aerial Services is superb. Very professional, honest and reliable and always delivers first class service at a reasonable price. Has helped us at very short notice and always try to accommodate a job into his busy schedule ASAP. Berkshire Aerials came out and installed three TVs with wall brackets for us. The team set up the wall mounted TVs as well as helping and advising on other aspects of my AV set up. I would most definitely recommend this company and will be calling on them again very soon. A great job and a very competitive rate. Very happy with the service and end product. What fabulous service from everyone at Berkshire Aerial Services, it took less than 24 hours from my initial enquiry to discuss my requirements to wall mount a tv through to completion of the job. The installation engineer, Sean, was friendly and professional and completed the work in a very clean and efficient manner with great care and attention to detail. Very happy with the service provided. Messaged in the morning, replied within an hour and aerial replaced by lunchtime! Very helpful and friendly people, reasonable prices and quick service. Absolutely fantastic service. I needed a new aerial to be installed on the chimney. The job was done straight away, I was informed about the price beforehand, so no nasty surprises. The installer was a top man, thank you again! Very good service no fuss polite staff clean and tidy job all round. The installer did a good job fitting a new aerial. Will definitely recommend them. Excellent service. Was let down by another company several times. Only wish I’d gone to Berkshire Aerials first! Very pleasant and professional. They replied promptly. Attended when they said they would. Mounted my television there and then and had a bracket that allowed me to tip the television to one side to avoid glare from a nearby window. They cleaned up after themselves. No reason to give them anything other than 5 stars. Outstanding, following an installation some three years ago, I contacted the team to ask for some further advice. Even though there was no commercial element to the request, Martin gave superb advice and support, I would without doubt recommend Berkshire Aerials to anyone who needs guidance, advice or help with all matters TV. The power of Facebook! I asked a local Facebook group for recommendations for an aerial company, as mine definitely needed looking at. Berkshire Aerial Services came highly recommended, so I made contact. Keith came round yesterday, could see immediately what the issue was likely to be, took down the (very old) aerial and showed me – completely damaged by the elements. Replaced it, and both TVs now receiving Freeview channels (albeit not all of them, but that’s an issue with the area reception I believe). Freeview is the back up for me if Sky goes wrong, so not a big issue. Keith was professional, knowledgeable and very quick. He took the old one away for me too. I will definitely use BAS again, if the need arises, and also definitely recommend them. The technician who arrived to do the work was very friendly and patient yet professional and efficient. I quickly developed confidence which put me at my ease and I have no complaints about the finished work. Martin and the boys are my saviours!! Keith’s been twice (yes, original iffy install…..should have used them not the other twits!) Couldn’t get a nicer or more competent set of people! First time I have used this company and service was very good. They came and identified issue with my dish placement immediately. Before doing an work to move the dish I was told the cost and when I agreed the work was carried out quickly with no problems. I would definitely use them again and recommend to others. WOW… what a service from the quote day to the installation day. I needed two cat5 cables to run from my house to a garden office… ~20m cable, around the house + digging + drilling + clips + wall sockets. Martin was on time, and spot on. Excellent work, fast, and SOOOOO neat (I am a perfectionist) and Martin was spot on. I would most definitely use them again and have told my friends and family too. 10/10 for this work, and customer service. Excellent courteous, prompt and professional- would definitely use them again. Awesome job from Keith on installing an aerial today. Really helpful and friendly. Definitely recommend! I have used this company many times over the years and always had great service. They have never failed to sort out any problem that I have had especially when I switched from Sky to TalkTalk as the box sent to me from my new provider was the wrong one and their engineer had the patience and knowledge to get to the bottom of the problem. I highly rate this company and would never go anywhere else. Hi! Very impressed with the service. Martin turns up when he says he will and is professional, clean and tidy. What more could you want! I needed an aerial when I changed over to TalkTalk as my service provider and I picked a local company with good ratings and they were excellent. Very friendly, very efficient, and re-tuned my TV to make sure that the new one was working properly. They even took away the broken aerial that was attached to the property. Excellent service from Martin. He arrived on time, carried out a signal test and let me know the full cost before starting the job. Clean and tidy while working around our home. Will use again and will not hesitate to recommend to others. Excellent service, fixed a long-standing problem in a residents room in minutes. Very good to deal with a company that was helpful, responded speedily and knew what they were doing! Martin was really friendly, helpful and did the tv mounting with an obvious wealth of skill and knowledge, totally recommend, very good price and a top notch customer service by phone and face to face, when calling on both occasions I quickly got through to an actual person who was totally professional and friendly as Martin was. Totally recommend, TV looks amazing now and gives me room back to manoeuvre in a cramped room. Fantastic service from start to finish. Martin and the team were really helpful, quick to install and made sure everything was tuned it. Highly recommended and very personable service! Thanks very much! A great service, a quick response by someone who knew what they were doing with no attempt to upsell and a totally reasonable charge at the end. Good guys, thoroughly recommended. I went to Berkshire Aerials after reading the incredible reviews. Martin certainly lived up to expectations and solved the problem of my internet coverage in thirty minutes, which had proved difficult to solve from other engineer visits. Polite courteous and friendly service. No hesitation in recommending him. A very pleasant and efficient young man, tidy and clean worker who knew what he was doing without adding extra cost. Would use again and highly recommend him. Friendly and capable people. They found the cause of our bad signal and fixed it the same day, all at a very reasonable price. Kids have their CBeebies back so everyone happy. Martin from Berkshire Aerial Services came round to fit a new bracket and mount a TV in the bedroom. I got an appointment within a few days of asking, the prices were clearly explained up front and he arrived bang on time. He was efficient, very neat and extremely helpful. Will definitely use again should the need arise. Brilliant service. Took down our old aerial from the chimney and installed a new one in the loft. Tidy, efficient, professional, responded quickly to our enquiry and fitted in the work around other activity at the house. Absolutely fantastic service. Arrived on time and sorted everything out. Everything works perfectly. Good price too. An excellent job! A very neat, clean and tidy installation. So much better having network cabling to feed my upstairs office instead of WiFi. Thank you! Brilliant job! The engineer was excellent in helping sort out my satellite dish, he even came back to replace the support brackets after the heavy winds we recently had. I have used Berkshire Aerial Services for a few years now and have always been happy with them. They are efficient and I would have no doubt recommending them to anyone. We have used Berkshire Aerial Services on a few occasions now and each time we have been extremely happy with the excellent service received. Their helpful manner, expertise & knowledge have been fantastic. Can’t recommend highly enough and would definitely use again if needed. Really pleased with the work carried out, installing an additional TV aerial for the back of the house. Gave us a couple of options, and the work was completed in good time. They fully explained in easy to understand language (!!) what they had done and I am thrilled with the results. Very happy to recommend their work. Great service! I was very happy with the work carried out. I would highly recommend Martin. Excellent service provided, very professional and quick turnaround too. I would highly recommend Berkshire Aerials. Thanks Martin, you came on time and did an excellent job, we will be recommending you to our friends and family. Very professional service. Honest, reliable, friendly and on time, fixed our signaling problems for us which was rather complex in our old Victorian house, and managed to hide all our cables (only noticed this after they had left, it looks so much better). The engineer also didn’t seem to mind our 3-year-old daughter following him around the house bombarding him with questions, and then set up CBeebies for her before he left. 5-star service would highly recommend. I rang Berkshire Aerials and I asked for a couple of days time and they fitted me in. My engineer arrived on time connected my new dining room tv to the aerial on my chimney pot and even took down some old aerial wire which ran all around the house without my asking thereby servicing a complete solution to my requirements. Thank you. We had no TV signal and wanted an aerial point moved. The engineer was professional, honest and did a very tidy job. Very pleased with the work that has been completed. A fantastic service. I have and will only use Berkshire Aerial Services. I needed an aerial to be installed at short notice and Martin came within 24hrs. A big thank you to Martin. I would highly recommend Berkshire Aerials. The aerial we have was fitted by this company over 40 years ago and we have never had any problems with it at all in all these years, so when we required extra sockets we had no hesitation in giving them our custom. Exactly the same polite service, not trying to sell anything unnecessary, just good old-fashioned quality and value for money. I have used Berkshire Aerial Services on many occasions and have always been very happy with the service provided. On this occasion they have attended twice because of an electrical complication (not their fault) and they have gone to a great deal of trouble to find a solution and have delivered as promised. Their level of professionalism, expertise and courtesy seems rare in this day and age. They are a real find and I can’t recommend them highly enough. Absolutely professional service. Very helpful and eager to get work done as quickly as possible. Would use them again and thoroughly recommend Berkshire Aerial Services. I recently moved into a new property that needed a brand new roof aerial and cabling into three rooms. The service and quality of work carried out was fantastic. I also got them to put up a TV wall bracket, again, faultless in service and quality. Would certainly use Berkshire Aerial Services again and recommend to anyone. Always a fabulous service from making the appointment with the ladies in the office to the guys turning up and sorting out the job required in a very professional manner. Always a pleasure. Excellent service, polite and professional. Would highly recommend and would definitely use again if the need arises. Been using Berkshire Aerial Services since we moved house seven years ago. Always a pleasure doing business with them. So polite, helpful and knowledgeable and always try their best to fit us in to get us up and running with our TVs ASAP! All the best for continued success with your business! I recently had Berkshire Aerials round to install a new aerial, he provided a very good service, the work was carried out to a very high standard also he very neat and tidy. The communication was very good, he even called to give us a 30-minute notice of arrival. I would have no problem in recommending them in the future. Thanks again! Called up Berkshire Aerials and they were able to fit my job in on the same day. He was extremely professional, quick and tidy. He fitted a new Sky point and tidied up all the external cabling to the external walls. Great job! Would highly recommend. Phoned them up and explained my problem, they were there next day and did an excellent job, the engineer could not have been more helpful, everything I asked for was no problem. He completed to a very high standard, would certainly recommend this company, keep up the good work and thanks again. Prompt, efficient, and meticulous service. The engineer installed a brand new aerial and we now have Freeview service (with HD channels) and no issues. Would highly recommend Berkshire Aerials. I can honestly say that I was most impressed with the service I received from Berkshire Aerials. I called to have an aerial installed on the Monday, Tuesday afternoon the guy arrived and with no fuss, completed the installation in a short period of time. Well done chaps, any need that I have in the future, I’ll be in touch. Great service, really pleasant to deal with, neat and tidy. Second time they’ve worked for me. Highly recommended. Take no chances, use these guys. You can’t go wrong. Great service. Fast and professional. The engineer installed my new TV including the mounting. Took his time after with me as well to teach me how to use the remote. Highly recommend to my friends and family. We used Berkshire Aerial Services to install a single aerial to cover one TV. They provided an excellent service, including the installation of the TV, and Martin was very friendly, efficient and tidy. Would easily recommend them and use them again. After having been let down FOUR TIMES! by Aerial Force, Martin turned up when he said he would, did what he said he would (and more) quickly and efficiently, at a reasonable price and solved the problem. Would highly recommend Berkshire Aerials. Excellent service… fitted me in last minute… did extra little jobs and reasonably priced… quick and tidy… Will definitely use again and recommend… thank you. Very efficient placement of FM and DAB aerials, did a good job making the cables discreet. Functioning well. Very good service. This was the third visit from Berkshire Aerials to undertake work at the house, this time it was HDMI extenders for the Sky box, as ever we were advised on the right kit for the job, given an estimate for the install etc and it was to the penny. The work was carried out efficiently and Martin was his usual cheerful self even at 6.30pm on Thursday evening. Quick, friendly, very clear in what they recommend and why. It wasn’t a straightforward job but they treated it just like any other. No pressure selling. Incredibly efficient, very tidy work and I can only compliment everything about them. Oh, and the aerial works perfectly now! Berkshire Aerial Services supplied an excellent, quick and professional service. I thoroughly recommend you use this company! Very impressed. Extremely prompt, friendly service. Excellent work undertaken and no tidying up to do as Martin did it all!! Very professional and would certainly use again and recommend 10/10. Fantastic service! Called in the morning and was offered an appointment the same day. It was a pleasure to deal with Martin who obviously values his customers and gives a proper, concise service without any problems. I called another company prior to this one and was put through to a call centre and referred to as “mate”, hardly the way to attract custom! Martin completed the job in an excellent manner and I will certainly be recommending him to friends and family. Keep up the good work! Fast, friendly and efficient from initial contact to delivery of service. I highly recommend Martin and his team. I would happily recommend their services for homes or companies. This was quite a big job in a block of flats and completely taken in their stride. Fantastic. We highly recommend Berkshire Aerials. They are highly knowledgeable and provide a friendly, polite and highly professional service. These days the complexities of television increase day by day and it has been great to have a company that can recommend the best solutions and be able to explain everything in simple terms. We have used Berkshire Aerials for installations in both our home and office for everything from fixing TVs to walls to sorting out poor local signals which is a problem in Bourne End and they have always provided a superb service, and have been a pleasure to have around. Martin was, as usual, very helpful, professional and polite. He repaired my aerial that had become loose due to birds sitting on it. He also filled the areas where some mortar had come down where the bracket had come away from the wall. Martin fitted some plastic spikes onto the aerial to prevent the birds sitting on it. I would highly recommend Berkshire Aerials! Third time used. All unrelated satellite problems. Each time Martin has been helpful, knowledgeable and solved the problem. Highly recommend. I had been let down previously by the services of two other satellite companies (they said they would attend between certain times and completely failed to turn up). I called Berkshire Aerials and Martin attended. He arrived within the half-hour time slot he gave me and carried out the work (tuning a dish onto a particular European satellite) effectively and efficiently and he also charged me exactly what he had quoted me over the phone. He was very approachable, knowledgeable and friendly. In future I won’t be wasting my time with any other company that promises to attend and doesn’t. I have no hesitation in recommending his services, as I think that he was first class. Excellent service. Prompt reply to emails to arrange to fix our signal problems. Courteous and capable. Good information re time of arrival and appeared skilled at diagnostics and repair. All sorted at first visit. Bonus that repair was not costly. Very professional, knowledgable and tidy. Give you a morning or afternoon appointment and calls you half an hour before they arrive to let you know they are on their way, so no need to wait in all day. Will be recommending to my friends and family and won’t hesitate to use again. I called three other companies and very pleased I chose this one, very professional from start to finish. Extending & enabling wi-fi throughout a 300 year old listed property and tidying up afterwards … a most professional and courteous service. Martin from Berkshire Aerial Services came today and sorted out an ongoing problem that had been happening for months. Finally, swiftly Martin dealt with each of the problems we had with our TVs. At last, a delight to have an engineer who knew what to do! I’ve used Berkshire Aerial before for aerial type jobs but this time I needed help with broadband issues for a house of multiple occupation. The job involved the installation of new independent wireless access points to each room set up with a broadband router. Martin was skilled in the task and so calm, patient and polite. The job turned out to have issues and took longer than anticipated and there was no fuss made about this. I would gladly use BAS and they are on my preferred supplier list and I would happily recommend them to friends and family. Martin first came to my park home by the River Thames in August 2015 after a recommendation by my daughter. He replaced the old aerial coaxial for me. I found him polite and very thorough in his work. I recently started to suffer breakdown in picture quality. Martin again attended and found the problem to be a ready-made extension aerial lead for inside my lounge having placed the television on a wall bracket. He showed me how the input reading to the TV was only 7 on the meter scale. He replaced not only the lead with a brand new made-up one while he was there but also a new wall socket. The meter scale went right up to the maximum reading of 10. Very efficient workmanship and I will recommend Berkshire Aerials should anyone else require prompt service. Many thanks. Excellent service and very speedy delivery. Polite and professional. Highly recommend this company for all aerial and fixing televisions on to walls service. The engineer was with us for practically a whole day installing our new TVs in the lounge and bedroom and he was an absolute delight to have around! He worked meticulously, made no mess at all and everything works perfectly. Would absolutely recommend Berkshire Aerial Services to anybody. Very professional, clean and tidy. Turned up when he said he would. Would recommend highly. Please do not hesitate contacting this company should you have a problem, the service they offer is second to none, carried out efficiently and quickly, and so nice to deal with, nothing too much trouble. Having bought a new radio and CD music centre, we needed a new DAB aerial fitted to work with the FM aerial already in situ fitted by Berkshire Aerials. Cookham Dean is a VERY difficult area to gain best reception of anything, mobile phones included. Martin showed patience personified and success was therefore inevitable. I cannot speak too highly of Martin at BAS. He is always prompt; so courteous and friendly; helpful and knowledgeable and goes the extra mile without being asked. He is so careful where he puts cable so that it is hidden away as best as possible out of sight. He teaches you the latest gadget and stays with you until all is perfectly working. What a star!!!!! Don’t go anywhere else for your TV and Hi-Fi needs. This is the second time I have used Berkshire Aerial Services and this time was to install our new TV set. Martin was on time, worked quickly and efficiently and was as reliable as he was the first time. Excellent service, the engineer was very polite and I would definitely recommend the company. Excellent speedy service. Assisted with a full hotel based in Berkshire whereby the TVs had stopped working. Problem turned out to be a very simple one, but extremely impressed with the professionalism of all concerned in getting them up and running. Will definitely keep on our books for future reference. This is now the third job Berkshire Aerials has done for us and, as always, am extremely happy with not just their work but also their efficiency. I would not use any other company and cannot recommend them highly enough, many thanks! Martin is brilliant, polite, well mannered and knowledgable. All my TVs are working fine now. Thank you for turning up on time. Very pleased with their service. Have used Berkshire Aerial Services for a number of years, more recently for a complex multi-room, multi-device AV solution. Their approach is highly professional and quality of work exemplary. Once again, did not disappoint. Always happy to recommend. Thanks. Excellent service, well qualified and personable engineer – thank you. Will certainly use again if the need arises. After having a previous aerial company to give a quote and was told that the roof tiles had to be lifted and the price was so expensive. I contacted Berkshire Aerial, the man who came said that was not the case, they did the installation in no time and very pleased with the price and neatness. This is the second time that we have used Berkshire Aerials and we could not be more delighted with the service we have had on both occasions. The engineer was with us within 48 hours and impressed us with his expertise and professionalism. Nothing was too much trouble and we have no hesitation in recommending Berkshire Aerials. Great service, with a quick diagnosis and resolution. We were back up and running in no time. Fantastic, prompt service. Would highly recommend. Martin of Berkshire Aerials did a marvellous job for us – he is extremely knowledgeable and, although the task was quite complex, nothing seemed to be too much trouble. We are delighted with the result and have no hesitation in recommending him. Very pleased with the service. Martin was a really nice guy, but I was also impressed by his thoroughness and professionalism. Great job, had our TV back up and running very quickly. Brilliant service, happy with work and price. This is the second time we have used Berkshire Aerials. We wanted to put a TV up on our living room wall and needed it to be connected to our aerial. The engineer came promptly and did a first class job of connecting the aerial and also fixing the TV mount on our wall. We were very pleased with the job. He worked in a tidy manner and was very polite and we would definitely recommend the company. The price was very fair for the time taken to ensure the job was done properly and efficiently. Brilliant!! Super efficient, extremely reliable and very friendly and helpful. Would definitely recommend them!! Martin arrived on time and was extremely efficient and carried out our new aerial installation in a most professional manner. He was excellent and I would certainly use their services again and not hesitate to recommend them to friends and colleagues. Exceptional service. Friendly, reliable and honest. Would not hesitate to recommend this local business. Second time using Berkshire Aerials and will continue to use them if ever needed! A very friendly, professional and thorough job done on both occasions. Excellent service, happy with price and installation. Great service from Berkshire Aerials. Have used them many times. Have used this contractor for some years. They are very efficient at diagnosing the problem, courteous and reasonably priced. Will ask for their help in the future and have no hesitation in recommending them. I have used Berkshire Aerial Services on several occasions for both installations and repairs and always found them to be very helpful and responsive. I would not hesitate to recommend them. Many thanks again for your help. Very helpful coming round initially to assess our needs and then returning to install a new TV point. Gave good advice and worked efficiently and cleanly. Will certainly be using again when we need and would highly recommend to others too. Friendly, competent, and efficient service. Very pleased, thank you. Martin is always reliable, helpful and efficient and offers flexibility around visit times. We’ve been using Berkshire Aerials for a number of years and can highly recommend for their great service and knowledge. A very professional job from start to finish, listened to what was needed and did a spot on job. We are now enjoying French TV at home. Very good service, efficient and helpful. Very patient with customer. Will definitely use again. Martin has just been over today for new TV tuning issues. Arrived when he said he would (a rarity these days). As on each occasion he’s had the knowledge to sort any problem. We’ve used him over the past eight years and would highly recommend him. Also great that I can leave him working if I need to pop out. Excellent service and so obliging. Wouldn’t try anyone else. Excellent service received from booking appointment through to the visit. Engineers were friendly and polite and nothing was too much trouble. I highly recommend Berkshire Aerials to anyone. It’s just a shame we are moving too far away for them to reinstall our TVs at our next house. Excellent service, thank you. Prompt, knowledgeable & polite with a ‘nothing is too much trouble’ attitude. The engineer did an excellent job for us. He was efficient, neat and tidy and a really friendly, intelligent person to deal with. The cost was very reasonable and I am extremely happy to recommend his work. Prompt, professional and courteous service received today, at a fair price. Contacted them because I had used them before and received good service then too. As that time was about 20 years ago it proves that they are both reliable and consistent! Reliable, efficient, trustworthy, good value for money, creative, neat and tidy, articulate and above all friendly. That’s how I would describe the service I got from the engineer at Berkshire Aerial Services and I would definitely recommend Berkshire Aerial Services!! Truly an excellent service, I couldn’t praise the service Martin provides too highly, not only efficient, but a very pleasant company to deal with, I would certainly recommend Berkshire Aerial Services. I was really impressed by Martin’s professional service from the very first contact on the telephone. He was informative and friendly and didn’t try to sell me something I didn’t need. He arrived promptly and diagnosed the problem immediately. My aerial was in a right old state and had broken down completely. He quickly and efficiently replaced it with a top quality aerial and lead and I have no hesitation in recommending Berkshire Aerials to anyone. Happy customer. Excellent service, arrived on time, problem sorted. Will not hesitate to recommend to family and friends. Great service and price! Really punctual, very efficient and nice to see modern booking systems being used too. Keep up the great work! Berkshire Aerials came today and fitted a socket in our bedroom for us. We did have two other aerial companies come, one said they would have to take the other aerial out and completely re-wire (at vast expense). Anyway we contacted Berkshire Aerials who made a appointment, sent a text to confirm, turned up on time, gave a quote did the job. Very professional, clean and a very good price. Would have no qualms on recommending this company. Great service, delivered as promised and on price as per estimate and most importantly problem fixed. Excellent service and very competent engineer who showed up on time and who thoroughly checked everything and found the fault quickly, replaced the part and showed and explained the faulty part to me. I thoroughly recommend Berkshire Aerial Services. Second time I’ve used Berkshire Aerial Services, they are very polite, arrive when they say they will, explain exactly what needs doing and are willing to try repairing rather than replacing if that’s a suitable alternative. All at a very fair price. I will definitely use them again and would highly recommend them to any one needing their services. Excellent service. Arrived on time and repaired a faulty part, after being badly let down by a misleading internet search who were not only extremely rude but didn’t bother to turn up. I was delighted with the service. I would highly recommend Berkshire Aerial Service. I’m a sparky and I’ve used or recommended Berkshire Aerials six times in the last few months. No complaints yet and I keep going back…..you do the maths. Superb service; arrived on time; agreed fixed fee; courteous polite and fitted aerials to a block of seven flats. Great communication and very reasonable prices. Highly recommended. Great service – polite and efficient. Would definitely use this company again. Brilliant service throughout. Kept in the loop all the way throughout and the guy who came out to us was an absolute star – would highly recommend. Thanks. Very efficient, polite and super quick. No tall stories from these guys – my spare part cost £15 – I wonder how many others would have tried to sell me a new dish! I can’t them recommend highly enough – thank you for your help. [The engineer] turned up on time as was very well presented. He was very efficient and tidy, he even cable tied some of my irrigation pipes that were hanging down! Couldn’t fault his work or his manner. Very pleasant young man and would recommend him. My daughter in Bracknell will be using him as well to sort her aerial out. Excellent. Knowledgeable, efficient, fast and friendly, neat and tidy. I thought that the engineer was only coming to assess and quote. Instead, in less time than I thought possible we had Cat6 cabling, new aerial leads, a signal booster and great reception. We did not have, as I was expecting, a new aerial because it wasn’t needed. These guys give you what you need, not what they want to sell. I highly recommend Berkshire Aerial Services. I cannot fault the service I received. Quick appointment date, confirmation call the evening before, turned up on time. Work carried out efficiently and cleanly and reasonably priced. Very polite and friendly. Excellent would highly recommend. Job was the routing of a wire connecting the hub to a vision box. Quite complicated due to length and shape of house and rooms. But the team did a superb job – really neat and tidy and we could hardly tell that a wire had been installed. First class and I can highly recommend. Excellent service. I knew in advance what the charge would be, the engineer arrived promptly, was polite, efficient and effective. I would recommend them to anyone. Really great service. Martin was happy to visit site prior to the job to assess what was required. Met us on site as arranged and did the job with no fuss or mess. Martin was very helpful and fixed the problem quickly with no fuss. Would recommend to anybody. Great service. Martin replaced my aerial 3 hours ago. He came when he said he would (contacted me by text to let me know exactly when), did what he said he would and it cost what he said it would cost. Friendly, reliable, good price, no rubbish, no mess and no surprises. What more can you ask for? Local companies like this deserve local support. I have absolutely no hesitation in recommending Berkshire Aerial Services to anyone. Fantastic service from Martin. Quick resolution with clean and timely installation. Martin was both punctual and reliable and demonstrated great customer service. Would highly recommend. Quick, clean, efficient. Friendly and very efficient and knowledgeable. Good communication. Highly recommended. A quick response was made by the engineer who came first thing in the morning after contacting us. Very satisfied with the service provided by Martin and Berkshire Aerials. Clear and concise pricing, courteous contact and good results. I was particularly impressed with the way Martin kept us informed about his arrival time and the way he didn’t try the ‘hard sell’ approach which unfortunately is common nowadays. BAS quickly adjusted our existing aerial, removed redundant antenna and cabling from the roof and offered (free) advice about how to fix a separate telephone cabling problem cheaply and effectively. Would definitely recommend Berkshire Aerial Services to anyone. Very quick response to my initial enquiry. Repair carried out most efficiently and offer to provide further assistance if required. I cannot rate Martin better than 10 out of 10, and would certainly recommend Berkshire Aerial Services. Thank you Martin. Thank you for keeping me connected! I have been a customer of Berkshire Aerials for 35 years. When we moved up from Wales we needed a new aerial fitting, which the current owner’s Grandfather did for us. 30 years later the current owner, Martin, came out and fitted a new aerial and connect my Humax box to an old satellite dish, and also connected two of my TVs to the satellite dish, along with cabling though the house. This week, Martin came out within 24 hours of my call to him to repair a splitter box that had broken while having a new TV fitted. Each time I have had dealings with Berkshire Aerials I have found them to be true to their word, extremely helpful and very pleasant. In my opinion [they] charge a reasonable rate for the job and their work is always to a very high standard. A message to them is always quickly responded to, and the work is always carried out when they say it will be. It is great to see the business being kept in the family and for Martin to be keeping up and maintaining the customer service his Grandfather gave all those years ago. I would highly recommend Berkshire Aerials to anyone who wants a job done quickly and efficiently, and with a friendly demeanour. Thank you Berkshire Aerials for keeping me connected for over 35 years! Had a few problems with my TVs and aerial connectors so called for help and advice. Was promptly called back by Martin who seemed to really understand all my difficulties and concerns. Visited my house the next day and spent time explaining everything to me and how best to repair. Very nice and professional manner and did a great job. Would highly recommend this company to anyone. Gave peace of mind, great service. Invoice came in at less than the original quote! Berkshire Aerial Services (BAS) set themselves the task of tidying up & rationalising all the external cabling and aerial on a four-storey listed house and fitting and setting up Freesat as a replacement for a rather cranky old Sky box, feeding three separate rooms on three different floors. BAS left everything clean and tidy, in good working order and explained how the new setup functioned. Their final invoice came in at less than the original quote … one cannot really ask for more! I needed to get a satellite dish installed privately on the roof of the flat as Sky was not willing to do it due to their stringent health & safety policy. I am extremely pleased that I found Berkshire Aerial Services via a Google search and called them to get an idea of the price. Martin promptly returned my call. The satellite dish installation was done by Martin on Monday morning (03.08.15). Martin arrived on time, saw the area and did a very clean installation. He finished his installation within an hour. He did not change his quote after coming on-site and even offered post installation assistance if there was any need. I highly recommend him for his professionalism and the quality of work. I have no doubt who to call in future when I am moving home. Excellent service really pleased with everything. Having recently moved in, we needed a digital aerial installing, aerial points in the house as well as the removal of an old aerial, satellite dish and wiring. Having seen good reviews for Berkshire Aerials, I called and left a message. I was delighted with the service. I had a return call a few minutes later and the engineer arranged to come the following morning. He quoted me for what I asked, gave me a time and estimate of how long it would take to complete the work. The following morning, he phoned at the time agreed to confirm the time of his arrival, arrived on time and he carried out all that had been agreed – everything was as I had been led to expect from our first phone call. The engineer was pleasant and very professional in the way he carried out his work. There was no fuss and he cleaned up after himself. I have no hesitation in recommending this firm and will definitely use them again if we need more work. Excellent service. Quickly installed my Freesat dish and mast. Very highly recommended. Great value for money. Will use again. I am very grateful for your advice and assistance in the pre-planning for the TV & Sky installation to our pub and flat and the engineers installed it in a friendly, tidy and very professional manner. I would have no hesitation in coming back to yourselves in the future. Good, clean, efficient job with friendly service. At a reasonable price as well, I’d recommend. After installing a new TV we lost connections to TVs in other rooms. We anticipated having to clear access to loft and more disruption. Martin identified the problem quickly and we now have a better service about the house than we ever had. This was after a previous visit by the service agent for the very large store we bought the TV from. Highly recommended. Martin was excellent as always. Just had Martin round to install a sky lead upstairs. Can’t recommend him enough extremely helpful will definitely be using them again. Very professional and reliable service. Have used Berkshire Aerials on a number of occasions and have always been very happy with the quality of work. I will definitely use Berkshire Aerials again and have no problem recommending them. Martin took my call (even though on his holiday) and managed to undertake the work at short notice to fit my challenging building schedule. Advised when would turn up and proceeded to deliver a fast and efficient service. No hesitation in recommending and using again. Excellent service. My second visit by Berkshire Aerials today, the last time a few years ago. Prompt, friendly and work completed in under an hour AND no need to buy a new aerial! Have used Martin before and needed him again to attach some pigeon spikes to the aerial to stop the pigeons roosting on the aerial and pooping on our new patio!!!!! Usual excellent service from these guys, completed the job on the same day as requested and hopefully we can sit on the patio now without having to have an umbrella over our heads!!!!!! Very professional service from initial enquiry to full installation of an additional satellite dish to receive Italian TV. The price we paid was as quoted and no works were started without full agreement. Martin was polite and ensured that everything was in full working order before he left. Will certainly use this service again. Excellent service, polite and courteous and very helpful. Sorted out my problems, recommended the fix and carried out the work quickly and efficiently. I would not hesitate to use Berkshire Aerials again in the future and highly recommend them. A good solid family business and local too. Can’t recommend Berkshire Aerials highly enough. They were very quick to come to our rescue and solved our aerial connection problem. Great job, well done, good price too. Thanks Berkshire Aerials! Excellent, speedy service. Job well done. Would definitely use again and recommend to my best friends! Quick, efficient service. Solved problem. Would recommend. I am very pleased with the service from Martin. New aerial and extra points. I have great picture quality now. Will definitely recommend to friends and family. Professional, friendly and quick. I am very pleased with the service from Martin. He came with his assistant and sorted our freeview and satellite dish. Arrived on time, job was done clean and tidy. The price was very competitive in comparison to other companies on the market. Would definitely recommend to a friend. The best in the area in my opinion! Very professional and friendly service received from Martin. He came and installed Sky for us and got it working when the actual sky engineers tried and failed! The best in the area by far!! Very professional and friendly service received from Martin. He provided and installed an aerial and set me up from scratch with a Freeview service. Very happy with the service and would not hesitate to recommend him to others. I was very impressed with the customer service. Martin was pleasant and prompt, turning up on time and doing the job of supplying and installing an additional TV point quickly and efficiently. I would recommend Berkshire Aerials and will happily use them again. Quick response and Martin attended and fitted new aerial on our roof. Advised that this could solve our problem without further cost and this proved to be the case. All TVs in house now working perfectly. Very quick and efficient service. Many thanks – highly recommend you to anyone needing attention to their aerial, reception etc. After the heavy winds our Sky box lost its signal, I called Berkshire Aerial Services at 3.30pm on the 1st April and they were with me at 7.30am the following day. Martin, the engineer, was exceptionally professional and helpful, and was extending his working day so we weren’t without Sky for Easter, so a huge thank you from us! Incredibly quick and professional service! Martin did a great job for us, came back today to fix a problem which may not have even been anything to do with his original work but fixed at no extra charge. Definitely recommend this company. A really professional company. Returned my call very quickly. Turned up on time for appointment. Very quick replacement of my old aerial and re-tuned all TV’s in house. Really pleasant installer and was transparent about pricing from the outset. TV reception is now excellent. I would class this as an excellent supplier in all respects. I contacted these guys today when I couldn’t get a signal on my Sky box thinking I had a dish issue. The gentleman on the phone was extremely helpful and asked me many questions. He explained that my problem was almost definitely a box issue and not a dish issue and to save a charge from them I should contact Sky. His diagnosis turned out to be correct and I am very grateful for his honesty where he could have come out, charged me and not been able to fix it. Thanks very much!!! Highly recommended!! Brill job, existing aerial eight years old and replacing of masthead amplifier and tightening of bolts to the pole was all that was needed. I was prepared for more! Invoice gave parts and labour and VAT. All itemised. Parts and labour were reasonably priced. I had my own hifi business for 32 years so had an idea of cost of parts and labour. I know people that have had aerials down by cowboys and been stitched up! I find this upsetting, especially as they were OAPs. Not so with Berkshire Aerials! Could not be happier with the quality of service and the manner in which our engineer went about his work. Exceptional quality of workmanship and knowledge of Freesat systems. Would not hesitate to use this company again in the future. Excellent. Look no further. It was nice to have the job done professionally & politely, Martin was very efficient. From my first call to Martin to the completion of the job I was very satisfied with everything, and would recommend their service to others. Just like to say thanks to Martin for a great service, he had good customer service skills very polite. Would not hesitate to use again. Requested a visit from this company to install a replacement Sky dish and LNB – engineer arrived as arranged, completed install, TV signal and TV setup check in an efficient and courteous manner. Whole thing only took 45 mins max – at a very reasonable cost. Very pleased with the service Berkshire Aerials provided, am happy to recommend them to friends, will use them again. Had contacted this company before over an existing satellite dish that was causing problems. Martin had the problem sorted in ten minutes. Have now had TV aerial and bedroom connection done. Would recommend this company for their sheer professionalism and politeness. Really happy with the service I received and the end result of my aerial issues. Found the engineer really helpful and accommodating to fit in with my work pattern. Would definitely recommend this company. Excellent service. Clean tidy and trustworthy. Fast response great service. Very pleased, thank you. [I] have used Berkshire Aerials on numerous occasions. Always an excellent service, on time and in my experience have always come within one to two days. [I] highly recommend them. A top notch professional service! Martin came out to me three times to sort my weak signal problems and now I am pleased to say that everything is working 100%. A friendly and professional service with prices all agreed upfront so no hidden charges. Highly recommended! Very satisfied by the work Martin & David did – installed an aerial, satellite & multiswitch to comms cupboard. Very professional, knowledgeable, friendly and efficient. A big thank you to Martin at Berkshire Aerials for simplifying the mess of my TV system. My problem was sorted within a day of me calling. Great job and I will be passing on your number to others. Great customer service! Communication was excellent, response quick and Martin did an excellent job, we shall certainly be using him again in the future if needed, thank you once again! We have used Berkshire Aerial Sevices three times now. The job is always excellent quality and they provide prompt and friendly service. We recently had a problem, Martin came over very quickly, diagnosed and fixed the problem within twenty minutes. I would definitely recommend them and wouldn’t use any other aerial service. Martin came round this morning to install an aerial point in my bedroom. He did a brilliant job. The work is exceptionally neat and unless you saw him actually do the work, you would not notice the wiring outside. Excellent work. Friendly service. Thank you so much. Berkshire Aerial Services provided us with a very prompt, efficient and competitively priced service for the provision of a Freeview television aerial, a DAB radio aerial and aerial boosters in a new house. They communicated well, arrived when they said they would, knew what was required and did the job very effectively giving us some extra help on a faulty connection left by our electrician. If only all service providers were as good as this! Excellent Service. Martin was very friendly, helpful and efficient. He quickly diagnosed the problem and sorted it out quickly. I would definitely recommend Berkshire Aerial Services. We were extremely grateful for your being available at short notice and we did not envy you being stuck up a ladder in the appalling weather. I am also pleased that I no longer hear the wails of “Dad, the TV isn’t working!”. Hope your business does well and we have passed on your details to two lots of friends who also think they have a problem. A telephone call, some professional advice and my problems were solved. Now that’s service. No ripoff visit. Even with a £45 service charge and no fix no fee policy, I would certainly use this company again if needed. Honesty, integrity and service. Thanks very much to Martin for his great work. He was very friendly and professional, and did a great job. We will definitely recommend him to friends and family.